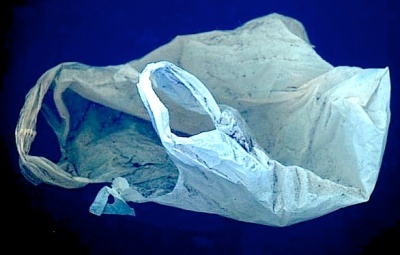 It turns out that there is a bacteria that'll eat plastic bags, producing nothing but water and carbon dioxide. This is spectacular news. Plastic takes thousands of years to decompose -- but 16-year-old science fair contestant Daniel Burd made it happen in just three months. The Waterloo, Ontario high school junior figured that something must make plastic degrade, even if it does take a millennia, and that something was probably bacteria. The Record reports that Burd mixed landfill dirt with yeast and tap water, then added ground plastic and let it stew. The plastic indeed decomposed more quickly than it would in nature; after experimenting with different temperatures and configurations, Burd isolated the microbial munchers. One came from the bacterial family Pseudomonas, and the other from the family Sphingomonas. Burd says this should be easy on an industrial scale: all that's needed is a fermenter, a growth medium and plastic, and the bacteria themselves provide most of the energy by producing heat as they eat. The only waste is water and a bit of carbon dioxide. Amazing stuff. I'll try to get an interview with this young man who may have managed to solve one of the most intractable environmental dilemmas of our time. And I can't help but wonder whether his high school already had its prom. If he doesn't get to be king, there's no justice in this world. COMMENTS for PLASTIC BAGS: BIODEGRADABLE! Max - true. My studies lead me to believe that there's always something that'll eat anything. Also - it's ant-season again. Woo hoo! Matthew - there's nothing admirable about mockery. Satire is one thing... but direct mockery is generally viewed as a lack of imagination. Worse ways to find out you have an infestation I guess.